In recognition of World Teacher’s Day, my dear friend Margaret posted a lovely tribute on Facebook this morning to the many teachers that have inspired her over the years. She acknowledged teachers we both loved, some I had forgotten about, and others that we did not share in instruction. She highlighted a few of the nuggets of knowledge she picked up from each. It comes as no surprise to me that the things she remembers and learned most of each teacher were not necessarily subject material from the class. A math teacher showing her how to draw a Snoopy out of the number 25 and an English teacher imparting compassion and life lessons: the things that matter. "Oct. 5th is World Teacher Day according to Pinterest. So I would like to thank a few teachers that have inspired me along the way. Mrs.Henzi thanks for helping me start loving art by having that coloring contest, Nancy O'Neal Lawrence for making my 3rd grade year so memorable, Miss Emke who taught me to draw snoopy out of the number 25 and made math fun, Miss Abrams who taught me more about life and compassion (miss you Abby Baby) and Becky Booher Kilgore who left me with an A to have her son who later became my student, but I am glad to call her my friend, Professor Parish who took me over seas just through his wonderful teaching of Art History. For Louie Laskowski and Jana Hankins and Donna Ward for being my Mentors and helping me realize that teaching art does have its rewards and for Dave Reynolds and Heather Givans for keeping me inspired during those years at Fulton. 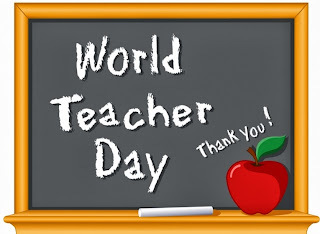 I thank all my teachers and teacher friends!" Teachers have always played a substantial role in my life. Some register on my radar because of their kindness, the way they disciplined me, the way they inspired me, the wisdom they passed down to me, and the examples they set of the type of person I could be if I wanted to. Others stood out because they taught me what to expect from the world, how to get ahead of the pack, why to respect my parents, my elders, my everyone, and most importantly, how to practice self-reliance. Additionally, a very small proportion of my teachers serve as a reminder to me of how NOT to be. There’s not a single one in the lot that didn’t impress at least one, if not many, very important lessons upon me. 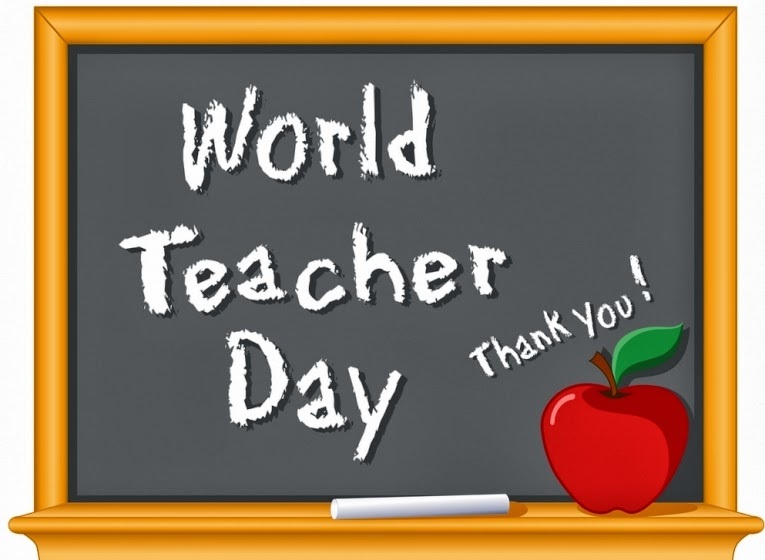 In reminiscing about all of my teachers over the years, the impact they had on me, and the many long-term relationships that were formed with them after classes were over, I began to wonder why I had never acknowledged World Teacher’s Day. My friend’s FB teacher homage referenced Pinterest as her source of knowledge on the day that was created to highlight world teacher appreciation, assessment, and improvement. Some quick research on my end showed that UNESCO, The United Nations Educational, Scientific, and Cultural Organization, has been celebrating this teacher recognition day on October 5th for close to 20 years now. I have never heard of it or UNESCO. But that comes as no surprise to me, as I had to also google “Is the United States a member of the United Nations” (sorry Mr. Trager, while you impressed a lot on me, history was not one of them). Bottom line is that today is a day to be thankful for teachers. Today is a day to reflect and maybe call upon those teachers that have impacted, molded, and maybe even pissed you off. Today is a day to remember that your children will grow into their intended being, influenced party by their teachers. Today is a day to start fresh in your viewpoint and approach toward your kids’ teachers. While you may think Mr. Such and Such doesn’t handle discipline well or Mrs. So and So is unorganized, our kids simply remember that Mr. Such and Such loved nature and taught them to be cognizant of our human impact on our environment and that Mrs. So and So tutored them when to draw the fine line of “if you can’t beat ‘em, join em” and count your losses and move on from an issue. Reading, writing, and arithmetic….all important. Demonstrating who you want to be and how you want to act and live your life are much more important, and that’s what these kids pick up from their teachers. We want them to experience all takes on the world, not just the one we hold as parents. I don’t remember who taught me that pi is 3.14159 or which teacher broke through my block of improper Spanish verb conjugation, but I do remember who sent me to the principal’s office for being disrespectful, which instructor noticed I liked to sing, and the name of the teacher who called me out for stealing another kid’s snack. Those teachers taught me humility, a lifetime love of music, and that lying is not part of my value system. Those teachers helped raise me into the human I am proud to be today. My childhood friend, who so eloquently honored the teachers in her life, moved on to be a teacher herself. She has not spent the majority of her life formally teaching art class, but she’s spent her life’s entirety teaching other people, her kids, and her students how to be good people through example. I know one day she will receive the formal appreciation from her art students that she is now giving to her life-long history of school teachers, but for today, I am her pupil and will express thanks for the impressive reminder of the importance of teachers.